There’s a great deal of discussion and debate around what will ultimately happen to banking as a result of the massive changes in connectivity, utility, mobility and customer experience taking place right now. One thing is for sure, the world is changing. We see PayPal owning online payments, with others like Stripe hot on their tails. Square is attempting to disrupt the POS and circumvent the existing payments rails by going cardless. Simple and Movenbank are vying for the new definition of the ‘bank account’. Telcos like Rogers applying for banking licenses, and ISYS pitching head-to-head with banks for mobile wallet dominance in North America. We also see Facebook and Twitter becoming increasingly dominant channels for customer dialog. So will banks get disintermediated in all this? Well, yes and no. In economics,disintermediation is generally defined as the removal of intermediaries in a supply chain: “cutting out the middleman”. So there’s not too many middlemen in the typical retail banking distribution chain. To some extent in financial services this is already happening with the decline in stock brokers, insurance agents, etc in favor of direct. However, conversely, a bunch of newer aggregators and intermediaries are popping up as the interface to the bank or payments providers. New intermediary plays in the last couple of years include Square, iTunes, Simple, Mint, and others. Probably the most interesting new intermediary to emerge in the last year or so is Google Wallet (or Google, or THE Google wallet – not like THE facebook though…) If you doubt the veracity of my statement, here’s proof – after just over 18 months of operation, Square supports 1/8th of all US merchants. They didn’t exist 2 years ago. So we’re likely to see more variations on a theme in banking and payments, where new players are coming into the ecosystem and offering value beyond the traditional methods of distribution. In its purest form, this will be simply a challenge to the branch-led distribution model. How so? Ultimately, with mobile banking and payments, the branch and resultant paperwork processes becomes a convenience “penalty” for transactional and basic onboarding. This friction is a target for disruptors. The disruption that is occuring in the customer experience is all about removing friction in outmoded or outdated processes for customers. Whenever you tell a customer he needs to fill out manual paperwork, or visit a physical location today, you’re going to increasingly get kickback from a segment of the market. While many will argue passionately for the role of a face-to-face interaction and the “richness” of the branch experience, the reality is that there are two reasons why most customers will balk at that. Firstly, they don’t have the time or they perceive it is faster to go an alternative route – convenience was always a key driver for disruptors like Amazon and iTunes. Secondly, we’re being trained that you can open pretty much any non-bank relationship completely digitally today – so KYC (Know-Your-Customer) issues aside, the push is for rapid digital onboarding of customers. In usability terms we call the later a design pattern and it ends up driving consumer’s expectations becuase it is a entrenced behavioral expectation. Digital natives won’t be able to figure out why you can sign up for Facebook, iTunes, PayPal and other relationships completely electronically, but your bank still requires a signature. It defies logic for the modern consumer, and no amount of arguing regulation will overcome that basic expectation. 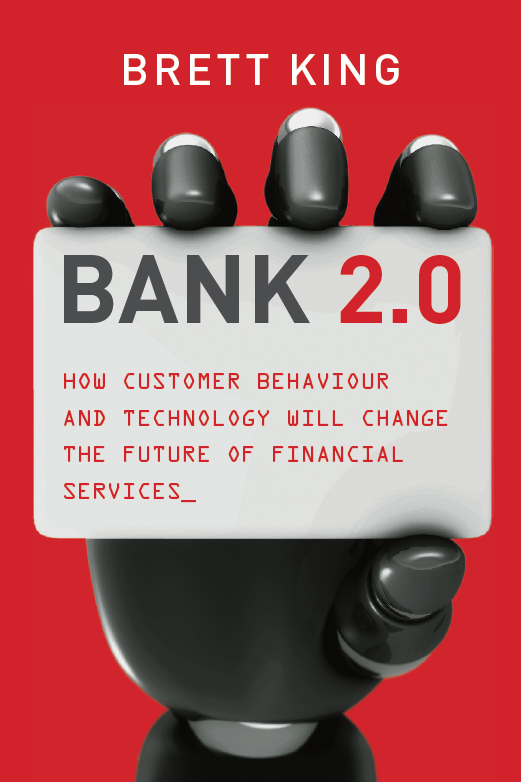 The end result of this is that banks being the slow, calculated and risk adverse organizations that they are, will likely allow disruptors the opportunity to come into the space between the bank and the consumer as a ‘friction’ eliminator. Secondly, geo-location and contextuality of banking products and services, will mean a marketing and engagement layer that is built on either event or location triggers to recognize the need for a financial services product and the capability to stimulate an engagement or journey in real-time. The mobile, wallet and tablet are all key components in this shift, as is social media and the cloud to some extent. In the end banks will, for basic products, no longer exclusively own the end consumer. They’ll simply be the underpinning bank manufacturer that supplies the product to a new distribution channel or channel partner. So will banks be disintermediated? Not really, but they will be disenfranchised, losing direct relationships with customers as banks adapt to becoming pervasive providers of bank products and services, when and where you need them. A split between the distribution and manufacturing of retail FI products will be the core outcome. In 1980 the average bank in the developed world would receive a visit from a customer once or twice a month, making an average of 20-25 times a year. As ATM machines started to emerge, by the end of the 80s average branch visits per customer were already starting to level off as the primary reason for visiting the branch – to get cash – was moving to the ATM. In the early 90s to combat this decline in visitation trend banks started to create specialist branches around High-Net-Worth-Individuals, and seek to attract the most affluent and profitable customers back to the branch. This strategy was successful in attracting new and highly profitable customer segments stimulated by loyalty programs, specialist branches and better service, but could it last? The reality was that it wasn’t until around 2006 that Internet Banking fully reached its potential as a disruptor. By 2006 the trend for Internet Banking adoption had become very clear, it was ready to overtake the branch as the preferred method of day-to-day banking. Between 2005 and 2009 Internet Banking usage doubled, and across the United States, UK and throughout most of the EU, Internet banking emerged as the leading channel for day-to-day access to banking services. The perception reinforced by some within the retail banking set was that this emerging behavior around Internet Banking was isolated to newer generations of customers only, and that older, more established customers were still keen to have the personal experience of a face-to-face interaction, or that customers seeking to start a relationship would always opt for the richer experience of the branch. However, the data did not bear this out. The earliest adopters of Internet Banking turned out to be the time-poor, affluent HNWI segments who valued their time over the upside of a branch visit. They could afford computers, the fastest Internet connections and had a strong incentive to use iBanking – they sought convenience and time saving. In 1985 70% of transactions occurred through physical artifacts and networks, namely Branches, Cash and Cheques. By 2010, however, 75-90% of retail banking transactions were processed through Internet, Call Centres, Mobile Devices and ATM machines. Today branches make up at best around 5-13% of total transactional traffic, and that is on a good day. As a result, branch staff are poorly motivated and in many markets staff turnover is toping 40% annually. The average customer is now visiting a branch in the United States less than 5 times a year, in some EU markets the average is less than half this number. This is resulting in massive closures of bank branches. That number doesn’t get better if you look at it another way – it’s just bad news for branch focused brands. In 1990 11 million cheques a day were written in the UK, by 2003 that figure had ballooned to 36 million cheques a day. By 2010, however, Internet Banking had caused that figure to crash dramatically to less than 1 million cheques per day. Why? Behavior has irreversibly changed. What used to be second nature to many is now a dwindling holdover for an ever shrinking demographic; those who hark back to the days of good old fashion banking. What happens in the next 5 years? Today we’re seeing mobile banking take off as the fastest ever growing channel for retail banking services. Today some banks are reporting a 300-500% faster adoption of Mobile Internet Banking than what they saw with Internet Banking. Rather than take traffic away from Internet Banking, the trend is for mobile banking users to actually increase their use of Internet Banking. So what’s more likely in the next 5 years? Is it more likely that customers will suddenly, spontaneously buck all these trends and spontaneously start using branches more, or will Internet and Mobile simply increase their march of dominance for day-to-day banking? The answer is obvious (to most). Why, then, do branch networks still command the massive bias in funding that they have today within retail banking P&L, and why do leaders in the digital space struggle for board-level attention and legitimacy? We’re not going back to vinyl records, the telegraph, or steam powered transport – we’re just as likely to go back to a banking system dominated by branches and cheques. This is an undeniable, statistical truth. The majority of us now (over 50% in developed economies) are simply too busy to drive down the branch, find a parking spot, stand in line for 15-20 minutes, to hand over the counter a cheque that will take 3 days to clear for a nominal processing fee. But it’s not just transactional behavior that takes the hit. Today if I’m looking to start a new relationship with a bank, the first place I go is to my search engine, and possibly my social networks. Admittedly there are still some who will seek to visit a branch to kick off a new relationship, but after that initial visit my day-to-day banking becomes pure utility and convenience. In 2007 when I worked on a global survey for Standard Chartered, 75% of customers in 42 countries said that Internet Banking capability was their primary criteria for deciding on a new banking provider. Regardless of whether I might come into the branch to get started, the fact is you aren’t going to be seeing a lot of me. That’s not the way I behave anymore. By continuing to favor branch from a channel investment perspective or organizationally from a strategy perspective, and by insisting on multi-year business cases before making real investments in mobile, social media and web, we are opening up a gap. This gap is a behavioral gap between how our customers behave everyday, how they want to bank, and how prepared “the bank” is to facilitate their needs. This gap can easily be exploited. The more banks insist on me conforming to their behavior and processes, the more I will feel the bank is irrelevant, out-of-date and a poor match with my needs. I’ll start to find workarounds like PayPal for transfers, or Prepaid Debit cards for day-to-day billing and payments. I’ll start to move my cash to other banks that have a mobile banking and iPad App. There are many who will argue that this is not enough to kill the branch – I say you won’t be able to afford not to kill them off yourself very soon.